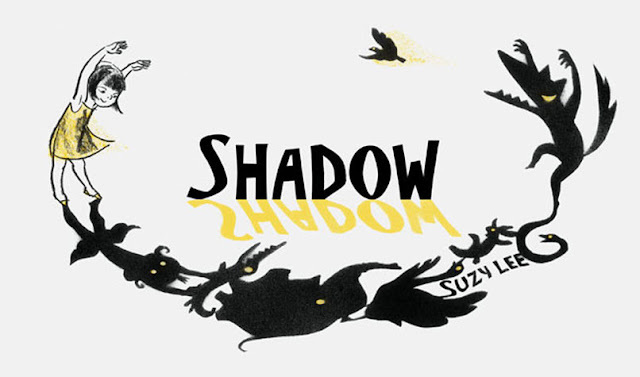 It is an egregious oversight on my part, especially considering the article I wrote, How to Read a Picture Book Without Words and the label on my blog, Stories Without Words, featuring wordless picture books, that I have never reviewed a book by Suzy Lee until now. 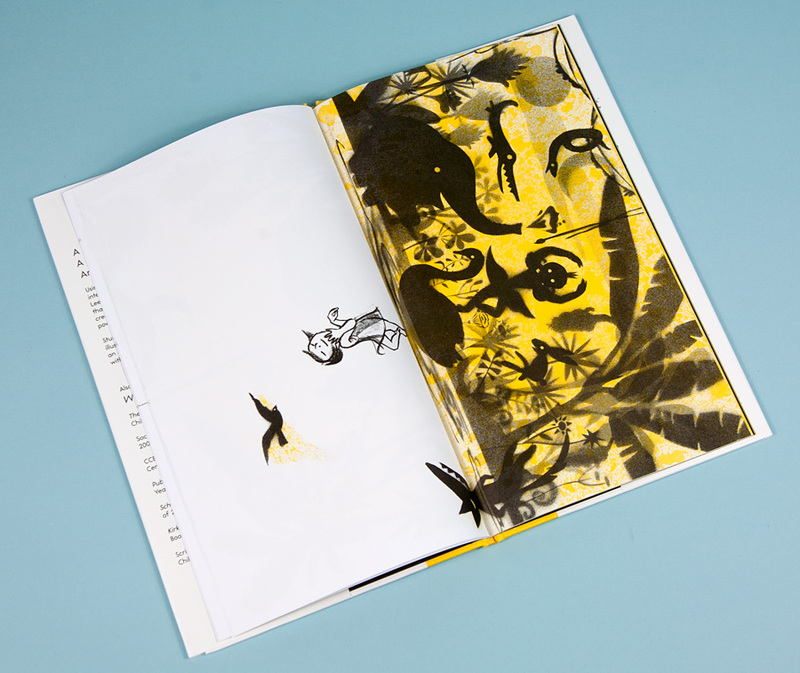 Lee is from South Korea and has a MA in Book Arts from Camberwell College of Arts in London which sounds like just about the coolest thing ever, to me anyway. Besides Korea and the UK, Lee has lived in Houston, Singapore and is back in Korea where she is raising her two children. While her most recent book, Open This Little Book, represents a change in illustration style and marks her first time illustrating the work of an author who is not herself, Lee likes to work with charcoals best, as I learned in an interview she gave at Seven Impossible Things in 2008. This medium works wonderfully for her three wordless books, Wave, Mirror and Shadow, which feature expressive little girls in stories that are bursting with energy, movement, joy and a little bit of fear and tension at times. Because these three books are wordless, writing about them is complicated, especially when trying to preserve the nature of the wonderful transformations of spirit and outlook that the main characters of each book experience over the course of their stories. I hope I do them justice and inspire you to purchase at least one of them for your little listener. Any one of them will open up a world of conversation and imagination. 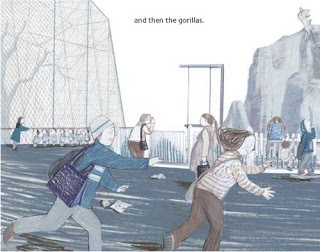 Although their styles are markedly different and the majority of his books have words, Lee's three wordless books remind me very much of the picture books of Anthony Browne. Both author/illustrators have an inimitable way of capturing and expressing the emotional experiences of children, especially children in moments of solitude, small moments that can be very meaningful, moments that can be sad and difficult or scary but ultimately happy. 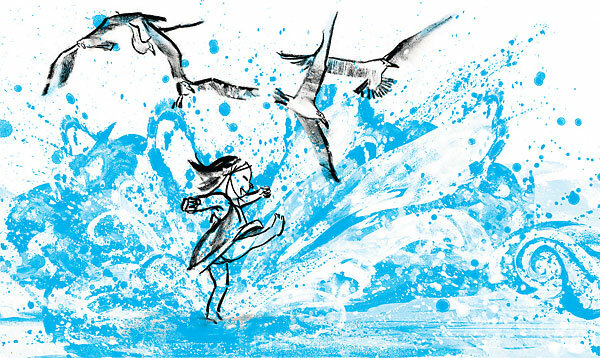 In Wave, the character, with a gaggle of seagulls hovering over and playing around (and along) with her, tentatively explores the ocean, her interactions getting more comfortable and exuberant with every return of the wave. 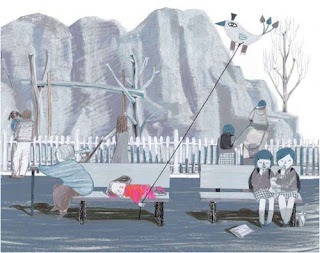 One thing that I especially love about wordless picture books, something that is exemplified by Lee's books, is the amount of detail that can be uncovered and discovered upon subsequent readings. 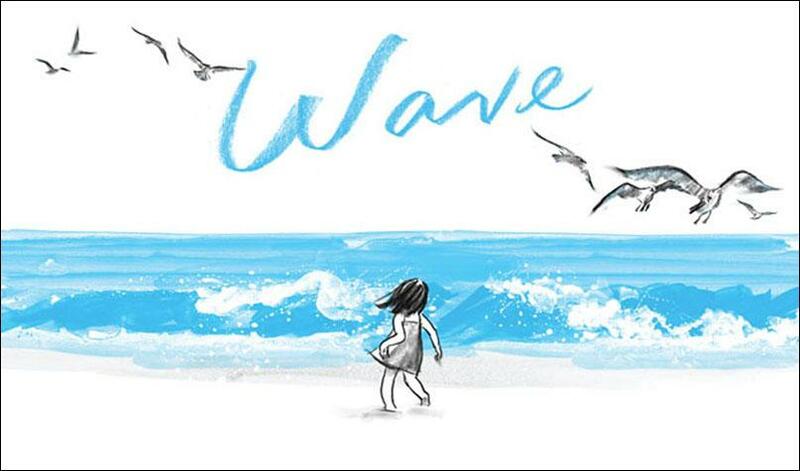 At the start of Wave, the little girl's dress is charcoal greys. By the end of the book, it is the same blue as the wave, echoing the little girl's increasing interaction with the wave. 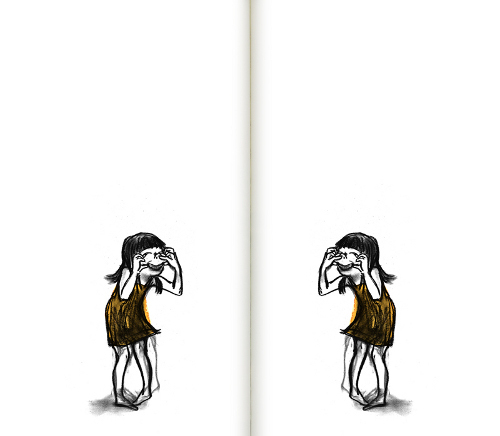 With Mirror, Lee explores symmetry when a little girl meets her reflection in a mirror. 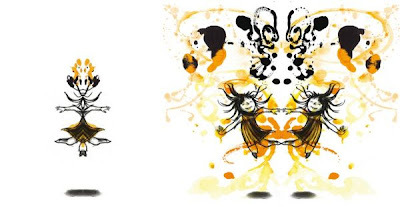 A circular story, ending where it starts, Mirror shares moments of exuberance with Wave, but this time things don't end so well for the little girl and her playmate, in this story her disobedient reflection. 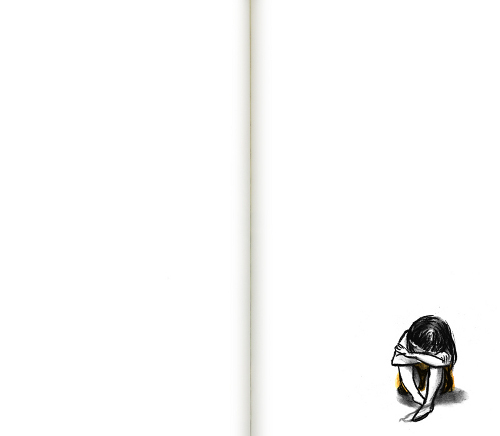 Lee's expressive illustrations tell a profound story that doesn't even need words. However, Mirror is a great book for one of my favorite things to do with a wordless picture book, make up my own story. 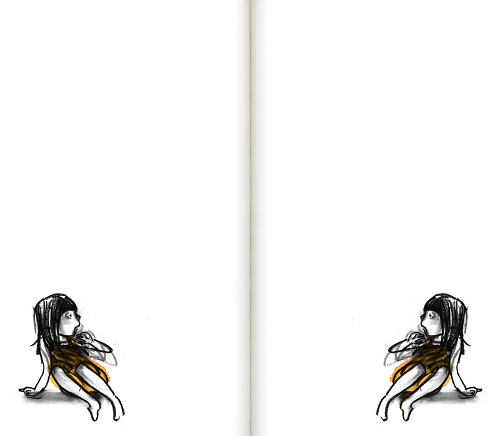 I don't want to give too much away, but I do want to point out something about Wave, Mirror and Shadow that you can probably tell by the cover images and I think reflects Lee's MA in Book Arts. Ninety percent of picture books have a standard trim size (the dimensions of the book itself) and are rectangular. However, Lee's three books have a trim size that reflects the content. Wave is rectangular and horizontally oriented, allowing the trim size to accommodate the in and out of the tide. Mirror, also rectangular, is vertically oriented and lends itself to the symmetrical nature of the story. With Shadow, Lee gives us another horizontally oriented book that invites the reader to turn it on its side so that the pages turn from top to bottom rather than left to right, matching the shadow play of the title character. 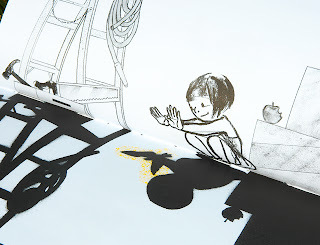 A little girl plays in her family's attic, gathering and arranging objects that, on the opposite page often cast shadows that look like something other than what they are. As with Wave, Mirror the little girl in Shadow presents some mystery, a little bit of fear and a lot of joy, all experiences through play and interactions with inanimate objects (that are not toys...) Again, Lee plays with the line between reality and imagination, the seam of the book being the dividing line between the two in Shadow, a shadow even jumping over the line at one point in the story. As Publisher's Weekly said of this book, "Once again, Lee focuses on a single idea, develops it with rich imaginative power and executes it with grace and finesse." I couldn't agree more! The Zoo, Suzy Lee's first picture book, does have a handful of sentences. 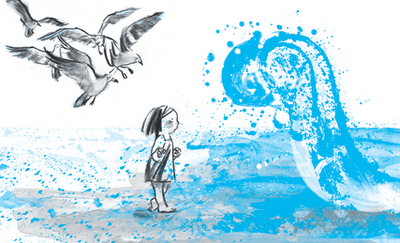 It tells the story of a little girl who visits the zoo with her parents and becomes separated from them. Reviewers all seem to have different interpretations of the story, many honing in on the parents' desperation over losing sight of their child. 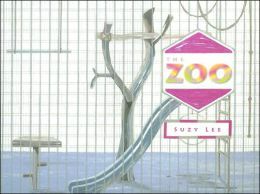 In her own words, Lee says that this book is "about the zoo, a strange place where children ad adults alike learn about nature, but also about its deprivation and despair. Curiously, children see the zoo differently from adults' perspective; they know how to make friends with animals." Almost entirely without words, Lee's books seem to tell more than one story at a time delving into a range of emotions that are very impressive.